The first Malaysian astronaut, Sheikh Muszaphar Shukor, is now on International Space Station (ISS), and he will stay at ISS for 9 days. The (relatively) big news, however, was that he wanted to pray in space, and so the issue of finding Mecca's direction from 220 miles above the ground was brought up. He's a devout Muslim and when he says his daily prayers he wants to face Mecca, specifically the Ka'aba, the holiest place in Islam ("Turn then thy face towards the Sacred Mosque: wherever ye are, turn your faces towards it .... " The Quran, Al-Baqarah, 2:149). That's where the trouble comes in. From ISS, orbiting 220 miles above the surface of the Earth, the qibla (an Arabic word meaning the direction a Muslim should pray toward Mecca) changes from second to second. During some parts of the space station's orbit, the qibla can move nearly 180 degrees during the course of a single prayer. What's a devout Muslim to do? f. Imagining the sequence of prayer. The daily five prayer times is defined in a 24 hour duration (equals to 1 Earth day) following the time zone at which port the astronaut is launched (in this case, Baikonur, Kazakhstan). a. Aurat for male is from the navel to the knee. b. Aurat for female is the entire body except for her face and hands below the wrist. It almost seems as if space-suits were made for Muslims. You can read about praying problems here. This is all a distraction. 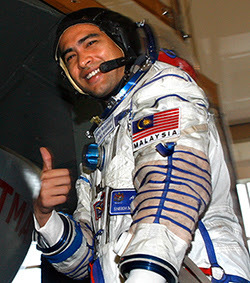 The main story is that Malaysia has its first astronaut in space. And thats great. ... but I still think its great that in the "Determining the Direction of Qibla" section the last point is "iv. Wherever". Good to know that once you can't find earth, the universe is equally holy in every direction. 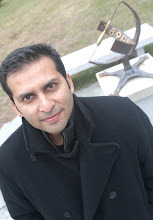 He's not the first muslim astronaut, though, so there's some precedent for what to do. I believe Prince Sultan al-Saud was the first unless one of the Soviet era cosmonauts was. I think the other shuttle astronauts on that flight helped him maintain (something like) the correct orientation during prayers. That would get very tedious on long-duration flights though, for muslims and non-muslims alike. The "wherever" option might be the most viable in the long term unless they were on heliocentric orbits where the Earth maintains its relative position for a long time. But it requires the person let go of that particular connection, which I suspect is psychologically and sociologically important for muslims. Letting go of something impractical (and, by the 'wherever' decree, unnecessary) but meaningful is hard. I also applaud the option of "wherever" - so people are not getting hung-up on strict interpretations. I think these type of questions may also have an effect on other issues, such as "sighting" of the Moon to determine the start of the month instead of astronomical calculations. Some places in the US have started doing that - ISNA (Islamic Society of North America) has published a calendar based on calculations, but they are also facing quite a bit of resistance (and this is in the US!). The disagreement was quite apparent at the last Eid (end-of-Ramadan celebration) just a week ago, when many mosques celebrated Eid a day before the ISNA calendar (and when Moon could not possibly have been sighted).